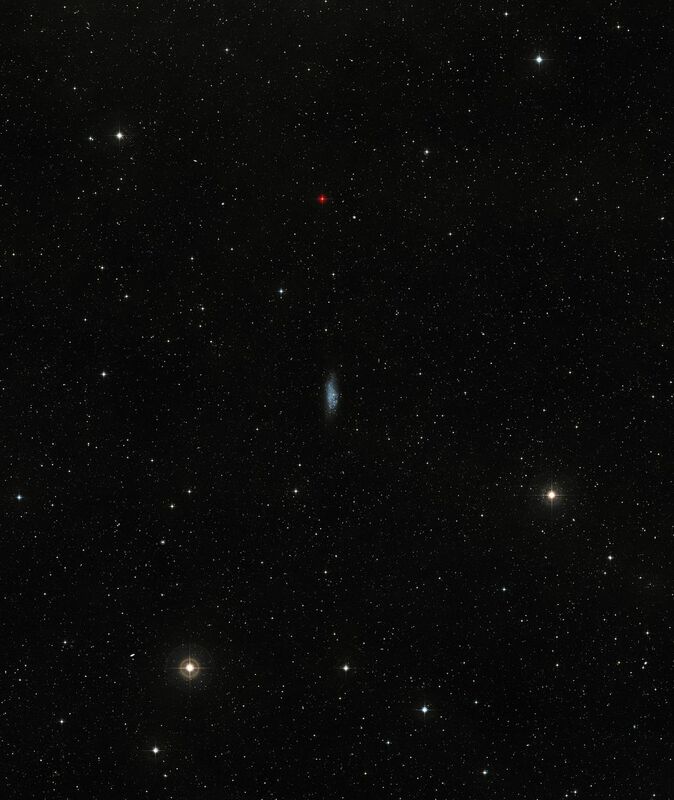 This scene, captured by ESO’s OmegaCAM on the VLT Survey Telescope, shows a lonely galaxy known as Wolf-Lundmark-Melotte, or WLM for short. Although considered part of our Local Group of dozens of galaxies, WLM stands alone at the group’s outer edges as one of its most remote members. In fact, the galaxy is so small and secluded that it may never have interacted with any other Local Group galaxy, or perhaps even any other galaxy in the history of the Universe. Rather like an uncontacted tribe living deep in the Amazon rainforest or on an island in Oceania, WLM offers a rare insight into the primordial nature of galaxies that have been little disturbed by their environment. WLM was discovered in 1909 by German astronomer Max Wolf, and identified as a galaxy some fifteen years later by astronomers Knut Lundmark and Philibert Jacques Melotte, explaining the galaxy’s unusual moniker. The dim galaxy is located in the constellation of Cetus (The Sea Monster) about three million light-years away from the Milky Way, which is one of the three dominant spiral galaxies in the Local Group. WLM is quite small and lacks structure, hence its classification as a dwarf irregular galaxy. WLM spans about 8000 light-years at its greatest extent, a measurement that includes a halo of extremely old stars discovered in 1996 (eso9633). Astronomers think that comparatively small primeval galaxies gravitationally interacted with each other and in many cases merged, building up into larger composite galaxies. Over billions of years, this merging process assembled the large spiral and elliptical galaxies that now appear to be common in the modern Universe. Galaxies congregating in this manner is similar to the way in which human populations have shifted over thousands of years and intermixed into larger settlements, eventually giving rise to today’s megacities. WLM has instead developed on its own, away from the influence of other galaxies and their stellar populations. Accordingly, like a hidden human population with limited contact with outsiders, WLM represents a relatively unperturbed “state of nature”, where any changes occurring over its lifetime have taken place largely independent of activity elsewhere. This small galaxy features an extended halo of very dim red stars, which stretches out into the inky blackness of the surrounding space. This reddish hue is indicative of advanced stellar age. It is likely that the halo dates back to the original formation of the galaxy itself, helpfully offering clues about the mechanisms that spawned the very first galaxies. The stars at the centre of WLM, meanwhile, appear younger and bluer in colour. In this image, pinkish clouds highlight areas where the intense light from young stars has ionised ambient hydrogen gas, making it glow in a characteristic shade of red. This detailed image was captured by the OmegaCAM wide-field imager, a huge camera mounted on ESO’s VLT Survey Telescope (VST) in Chile, a 2.6-metre telescope exclusively designed to survey the night sky in visible light. OmegaCAM’s 32 CCD detectors create 256-megapixel images, offering a very detailed wide-field view of the cosmos.